Remember my Crochet Class in a Vest blog post about a week ago? I’m happy to report that Flowerfall is progressing nicely through the pattern writing obstacle course. View full size image. Watch me open the armholes after I finished crocheting the lace: Snip & Unzip An Armhole. These self-healing stitches don’t mind being cut. It’s the low-stress way to create armholes. Really! Much easier than breaking the crochet flow to place them correctly. Flowerfall is a modified diamond shape: imagine a diamond with its top and bottom corners lopped off. You start crocheting the shape at the left front corner and end at the right front corner. The armholes are generous and not centered, which increases its wearable ways. You can even treat the armholes like head openings. That results in a poncho look, see the bottom images. An older design, the Leftfield Diamond, is the first time I crocheted this shape. That’s when I found out how versatile it is. See the top right-hand image above? There’s a hint of a tie belt at the waist. It inspired me to add ties to the front corners for a wrap belt option. These are removable and repositionable, with a petal-like accent that echoes the chained petals in the stitch pattern. I don’t have photos of them yet. You can keep up with Flowerfall at its project page. It’ll work out great for at least two of my class topics: 21st Century Love Knot Adventures and Self-Healing Stitches & How to Cut Them. Up to date as of 4/11/18. This page will likely be updated again before class time and possibly after. View full size images of steeked swatches. Considering signing up for this class? Read Why “Self-Healing” Crochet Stitches? Issue #83, Hidden Pictures in CUT Stitches! 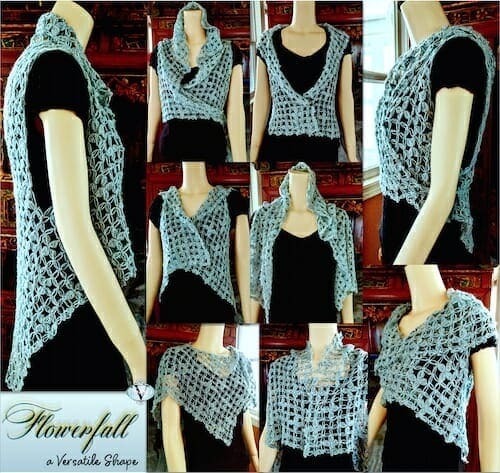 All of Vashti’s steeked crochet projects in Ravelry! Mesmer Veils pattern. Smokestack pattern. Original post about the Mesmer pattern release. Public photo album for the Mesmer and Maze Vest designs. Self-updating search results for all steeked crochet patterns in Ravelry (total of 10 as of 4/11/18; 8 as of 6/1/16). Self-updating search results for steeked crochet projects in Ravelry (35 as of 4/11/18; 13 as of 6/1/16). Three strong fashion trends are relevant to this class topic: graphic/linear texture, net lace, and fringe. I’ve created a Pinterest board for each trend. Steeks: Ideas These are often simple shapes that become magically wearable and trendy with just a cut or two. Trend: the New Fringe I thought today’s fringe was a passing fad but it continues to have a lot of mojo! That’s great for us. Many cut stitch patterns beg to be fringed, especially if you don’t want to use a double-ended hook for Tunisian lace nets. If you cut across several rows, turning that cut edge into fringe is the ideal thing to do with all the ends. 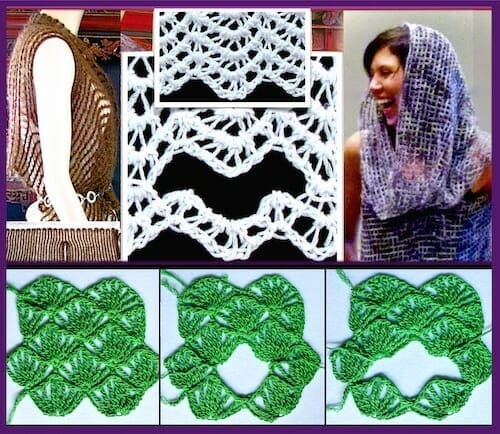 Trend: Simple Crochet Mesh Nets It’s a classic fabric with fresh boho looks. It’ll be a long-term trend because it’s also now going urbane-futuristic-techie. Cutting self-healing stitch patterns is a unique and fun construction method. It makes pattern schematics newly inspiring! You might enjoy newsletter #80: Pattern Schematics for Insiders and Outsiders. Any Books on Cutting Crochet? 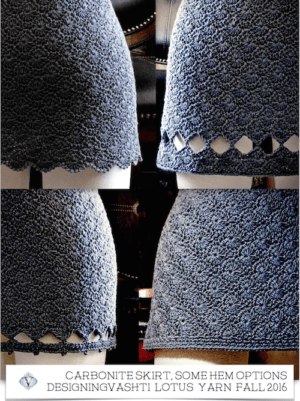 Original 2016 Steeked Tunisian Lace Class Resources page.